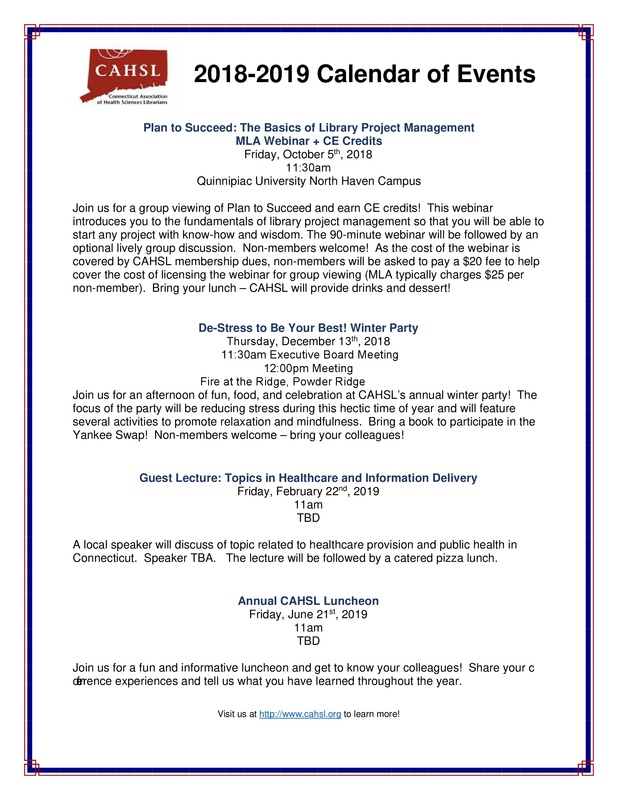 A great write-up on CAHSL and the NNLM NER teaming up to table at the 2017 Connecticut Library Association Annual Meeting. Connect with CAHSL on Facebook and Linkedin! You can email us at cahslinfo@gmail.com and we will gladly answer any questions you have about our organization. Janene Batten was chosen in the first cohort of participants in MLA's Research Training Institute. Holly Grossetta Nardini has received the 2018 Estelle Brodman Award for the Academic Medical Librarian of the Year. Jen Martin is now the Supervisory Librarian, VISN1 Knowledge and Information Service.